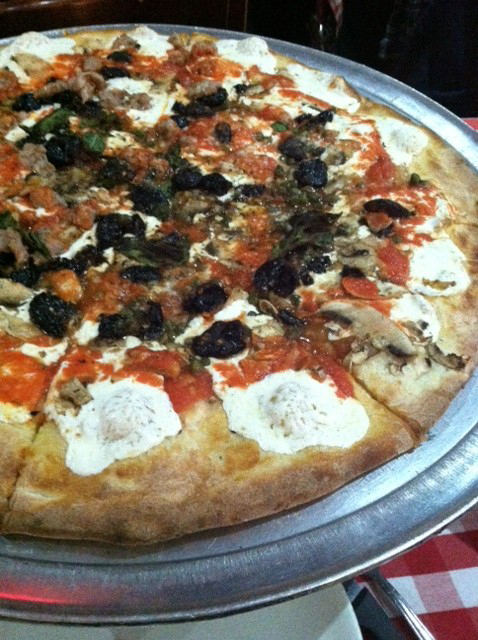 Ballard Pizza Company is the newest outpost of the Ethan Stowell empire, serving NYC style pies and slices. While it is a more pedestrian price point than his other spots, it is with the same care in food prep and ingredients choice. On a recent stroll to Old Ballard from work one day, I decided to pop in and take advantage of “Flour Hour” (a steal at $2 a slice, 3-5p & 10-11p M-Th). Slices are normally $3-3.50 which isn’t bad either, especially given that one slice is big enough for a lot of folks. I tried the special that day which was ricotta, spring onion and kale – a spot-on trio that made me happy. While the focus is on the pies, there are a few salads, starters and desserts along with a few choice libations to wash it down. Open late too, this straightforward spot with a friendly staff is a good go-to in the neighborhood! We strolled from there over to and through the lovely Prospect Park (Brooklyn’s Central Park – also designed by Olmsted) to make our way to the Brooklyn Botanic Gardens. A classical oasis that seems like a great getaway in the city. 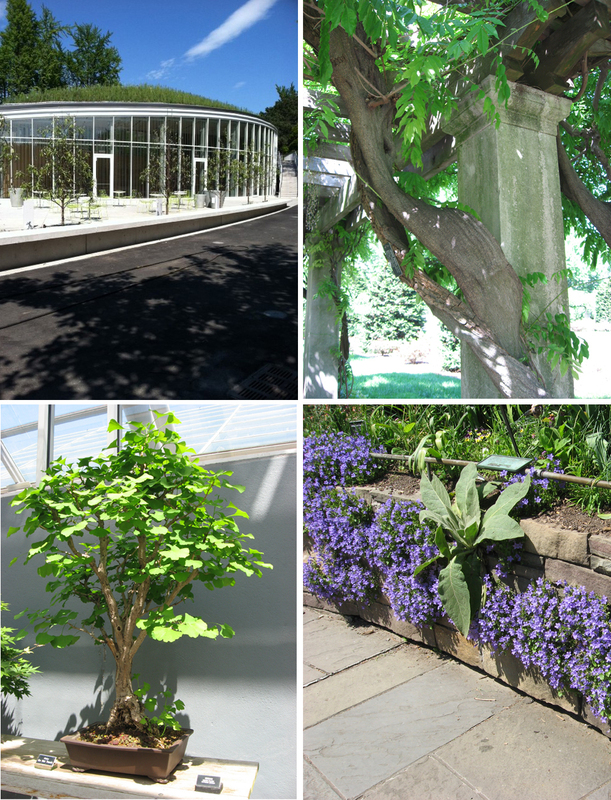 The bonsai exhibit was my favorite (above, bottom left), and I was impressed by how many of the plants are labelled so that you are never left wondering. The new visitor center wasn’t quite open (above, top left), which we had hoped to see (designed by Weiss/Manfredi, who did Seattle’s sculpture park), but looks like it fit into and opened up to the landscape beautifully. All that wandering called for what was next – some soaking and sauna-ing for a late afternoon at Body by Brooklyn spa. We ended that particular day at Grimaldi’s – arguably the best NY pizza – that my friend Karen introduced us to years back. The coal-fired oven (hottest out there!) seems to be the trick, and there are only a few of those out there. Ownership apparently changed hands since I was there the last time and it moved a few doors away into a larger space – but the olive, mushroom, mozzarella pie still made us very happy! Down the street, we checked out the new (to us) Brooklyn Bridge Park afterward to walk it off. Apparently outdoor movies and concerts happen there in the warmer months – with downtown Manhattan as a backdrop – would love to go back for that! There are all sorts of great shops, eateries, galleries and architectural projects to wander through in Williamsburg (we focused on the area around Grand and Berry streets). Of specific note from our stroll that day were the Brooklyn Art Library – home of the Sketchbook Project, (above, right) where you can ‘check out’ any of the sketchbooks folks have submitted from all over the world and get a glimpse of their year in the project. We had seen it out in Seattle when they were touring the project – fun to see it in its home. Also, Mast Brothers – the uber-crafted, sustainable chocolate makers (above, left). They approach chocolate making with incredible craft and reverence for the process and the growers, and each bar is hand-wrapped in ornamental papers. They’ve even employed sail boats to deliver their cacao beans, making it as sustainable as possible. Their chocolates have wonderful flavors and each bar tells a story. A couple of days wasn’t nearly enough to check out Brooklyn – we will most certainly need to head back again soon! the High Line! We hadn’t been to New York since the ‘aerial greenway’ park (above) was finished, and the architects in us were excited to see it. It did not disappoint! Some great design moves, and an incredible public space along a mile-long stretch of re-purposed elevated railway. Great spot for a stroll, with a unique perspective of the west side of the city, and a few different spots for picnicking and people watching. After the High Line, we spent the afternoon at MOMA (courtyard above, middle) perusing the Cindy Sherman exhibit – wonderful and creepy all at once – as well as featured pieces of Diego Rivera, Elsworth Kelly and a printmaking show. Foreclosed: Rehousing the American Dream – was an unexpected thought-provoking exhibit as well. Also in the art realm, we spent an evening at the Whitney Biennial – honestly, a lot of the visual art left us a little underwhelmed, however getting to see Alexander Caulder’s Circus was a highlight of the trip for me – I had always loved the little movie he made with this menagerie. And the time spent listening to Esperanza Spaulding along with her standup base was a lovely and captivating surprise too. A late night snack was in order after all of that, and we had heard great things about Danny Meyer’s fresh, quality, food-for-the-masses endeavor, Shake Shack. There happened to be one a few blocks from the Whitney, where we ordered several things to try (in the spirit of reporting, of course). The burger was the highlight (even for this predominantly veggie person) – and the shake was close on its heels (above, left). As a displaced-southerner, my interest is always piqued when a southern-style spot is getting a lot of attention. I had come across mention of Tipsy Parson in Chelsea several times with high accolades. It was a perfect afternoon reprieve spot to sit a spell with snacks and libations (above, right) that gave me a touch of home, right there in the big ol’ city. On a hot day, don’t miss the frozen mint juleps! Another favorite afternoon respite was found at Bouchon Bakery and Cafe, the Thomas Keller bakery at the Time Warner Center. Most people come to Bouchon for the baked goods, but I say sit down for a spell for a late lunch too. Shawn had the perfect quiche, and my salmon rillettes (above, left) with its delicate smokiness, and my arugula potato salad made me very happy too. Of course we had to get some sweets to take away too – macarons of course, but also some Keller takes on classics like: peanut butter cups, peppermint patties, and Shawn’s fave, ho-hos. Our last night in the city, we went to Spice Market, the Jean-Georges Asian food-cart inspired restaurant in the Meat Packing District. With the tasting menu you get a 9-course sampling SE Asian inspired dishes, and with the wine pairings all flavor highlights are hit within the meal (samplings, above, middle). All the dishes were good, but I was most impressed by the simplest of dishes – the ginger-fried rice. The space definitely sets the scene as well (above, right). A great night was spent at the Comedy Cellar (above, left) – a veteran comedy club in Greenwich Village where on any given night you can see the famous and the up-and-comers honing their sets, up close and personal. We happened to see Colin Quinn, David Norto and our favorite that night, Ryan Hamilton. As our last morning was a bit rainy and Seattle-like, it seemed fitting to find Ace Hotel, check out the Seattle-based company’s hip-designed Manhattan space, and drink some Stumptown Coffee to mentally prepare for our trek to the airport and home.